At Water Direct, we offer a variety of alternative water supplies, with bulk bottled water delivery being one of our most popular solutions. We store over 3,000,000 litres of bottled water across the UK meaning its ready for rapid delivery to any location at any time. 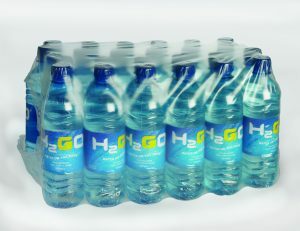 Our H2gO branded bottled water is often top pick for event organisers, as well as for industrial and corporate uses with the variety of bottle sizes we offer, as well as the clean, crisp branding and swift delivery options. We also provide our own brand of larger bottled water called Courtesy Water, which is often distributed under emergency requirements but can also be delivered for commercial use. Our bulk bottled water options are available for pre-planned deliveries with emergency and same day response available for our 2 litre Courtesy Water pallets. All of our bottled water has a 2 year shelf life from the date of production. We recognise the potential environmental impact of waste from plastic water bottles which are a necessary element of the delivery of our drinking water services. To minimise this, we are working with our producers to increase the use of recycled packaging, we recycle wherever possible and encourage our customers to do the same. This is the best way to reduce the impact of plastic waste on the environment and all our bottles are 100% recyclable through household and commercial waste channels in the UK.